Frames from a vintage spanking animation. Spanking animation is non-mainstream animation that shows spanking scenes. Spanking animation is often (but not necessarily) cyclic animation (i.e. a number of frames is repeated in a cyclic sequence). 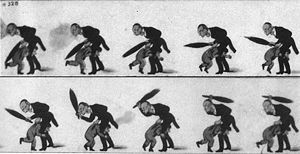 This type of spanking animation has a long history and goes back to the end of the 19th century, when the first optical devices for animation were invented. Today, most animation is created with the help of the computer, and usually also viewed on a computer. Popular graphics file formats for animation are GIF and SWF (Flash). The vector-based Flash format requires a player or bowser plugin and allows sound as well. Flash-based spanking animations are usually interactive; for a list see Spanking in Flash games. Artists who do spanking animations include Comixpank, Gauis Marius, Kitora, Marm, Smallmew, Spanm, and Uasketcher. For spanking in mainstream animation, e.g. cartoons, see spanking in animation. A special case of spanking animations are spanking emoticons. Miho Chan Egroup: MSN group dedicated to an imaginary 1960s magic girl character. Features original art and animation by Gauis Marius. Membership required. Shoujo Imageboard: Gifs: Fubata style imageboard maintained by Noman, features animated gifs taken from various animated series; includes a number of spanking gifs.